We found, and part of the reason for this increased shipping, is that, there’s a larger growing disparity between best-sellers and mid-sellers and low-sellers. There’s good sellers and medium sellers but the lower sellers are selling lower, lower and dropping. And those were always miniseries or one-offs or things that don’t count. And what we’re finding now is that fans want things that are part of the continuity. They only want the main titles. They want Amazing Spider-Man, they don’t want Avenging Spider-Man. I find this quote indicative of a trend I've been seeing which is the people buying comics now are getting more single (narrow?) minded in their buying habits. What used to work in the last decade (spinoffs of successful titles like Avengers and X-men titles) is now failing because the mish mosh of continuity that exists in 5 different Avengers comics tells this current generation of readers that the story doesn't matter. And when you basically selling your comics solely on the principal that the story matters and this event will change everything you know about the Marvel Universe! then reader apathy is a death-knell. So to combat this, Marvel has decided that since readers will only follow one comic continuity for Spider-man, then they will simply publish multiple issues of the chosen title. That sounds bad to me. Aside from sounding like a stop gap solution that doesn't really address the real issues causing shrinking sales, it means that Marvel will be less inclined to produce comics which tell stories alongside their current continuity. And I think people forget that stories can work like that. Fans tend to think of things as In Continuity or Out of Continuity but I think some stories can exist alongside continuity. When I used to read Marvel Team-Up back in the 70's, I never cared if the story I was reading was paying attention to regular Spider-man continuity (and often there were nods to what was going on in the other titles) All I cared about was did the issue I was reading follow the last issue I had been reading? Simply put: Was the internal continuity consistent? Then I was expecting to see him in Issue 37. Outside of that, I didn't care how closely the title was tied into events in Amazing Spider-man. A lot of comic fans seem to want to take an all or nothing approach to continuity, believing that a tightly policed continuity makes for a good comic universe. I don't know how true that is. Yes, it's good if Green Kryptonite works the same way everytime Superman encounters it, but tight continuity is easier to manage in done in ones. When you have the same character in multiple tiles with long ongoing stories (like Wolverine), then continuity becomes a logistical monster. It's no wonder editors ignore it. With that, I will leave you with today's free comic, a monster of another sort: Frankenstein! 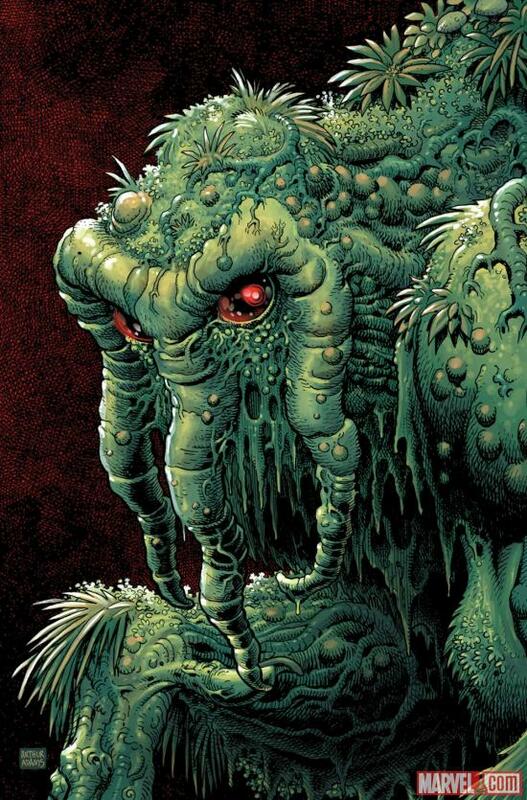 Last week saw a bit of good news for fans of Bronze Age Muck Monsters with the revelation that Marvel was going to publish a lost Steve Gerber Man-thing script. 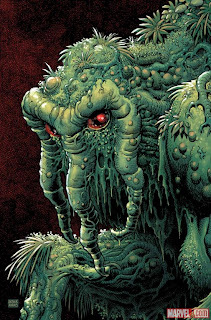 INFERNAL MAN-THING, a three-issue limited series beginning in June, will present the final Steve Gerber Man-Thing tale, a previously-unknown story that until recently remained only a wishful thought in the hearts and minds of his devotees. To illustrate such a landmark series, Marvel has brought in the equally-acclaimed Kevin Nowlan. I've always been a big fan of Man-thing, but over the years, he's never had the same success as his spiritual brother Swamp Thing. I think part of that has been that Man-thing, as a concept, doesn't play quite as well in Marvel's superhero filled universe as DC's version. There are only so many stories you can tell where Spider-man teams up with a character who doesn't say anything and burns the villain in the end. Swamp Thing, on the other hand, isn't mindless and has the advantage of being able to talk from time to time. Also, much of Swamp Thing's longevity is no doubt due in part to the drastic shot in the arm Alan Moore gave the franchise. That coupled with his two movies, television series and cartoon give DC's bog beast stronger roots in readers minds. On the flip side, Jeff Parker has been using the character in some interesting ways in Thunderbolts, proving once again that in the hands of a good writer, even characters with some limitations can prove compelling. Thinking on the news, I wondered if we might finally see an Adventures Into Fear Marvel Masterwork? 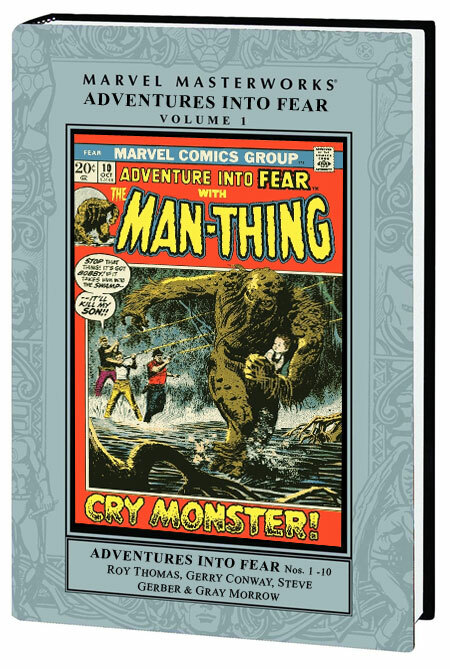 There are two Man-thing Essentials, but I think the old stories deserve to be collected in color. Here's my mockup of such an edition. Keeping in the theme of Muck Monsters, here is today's appropriate Free Comic. Airboy Comics 9, with the first appearance of The Heap! Well, congratulations to DC and Geoff Johns. They managed to shake me out of my extended break by giving us a small glimpse of their plans for revamping Captain Marvel into a new Grim and Gritty version. ...but let's skip that for now. Here's the thing, WHY did DC think the Captain Marvel franchise really needed to be revamped in this fashion? Weren't they happy with the way the Jeff Smith Monster Society of Evil grahic novel came out? At the time, it seemed like they were. And it still is lauded as a great example of a kid accessible graphic novel, so I kind of thought they would continue down that path. I even said I had positive hopes for John's version of the character a few months ago. Anyway, enjoy today's Free Comic Monday which features another version of Captain Marvel which will undoubtedly be more lighthearted and enjoyable than anything we are likely to see in the near future. And I have grown accustomed to a life outside of blogging.